When a man so anemic that he could be a vampire’s victim comes to Patricia Savage for rescue, the impetuous girl can’t say no. Excitement is her meat and danger her dessert. Accompanied by Doc Savage aide, Monk Mayfair, Pat finds herself in the worst danger of her life. Wanted for murder, hounded by the minions of a weird mystery figure calling himself Chief Standing Scorpion, narrowly evading the hordes of the Vinegarroon tribe, the bronze-skinned golden girl battles her way to a sinister secret cached in an ancient ruin. From the oilfields of Oklahoma to the forbidding Ozark Mountains, the trail of scorpionic doom winds. Will Pat Savage’s first great adventure also be her last? Who is this monster? Why does his name strike terror into the hearts of brave men? 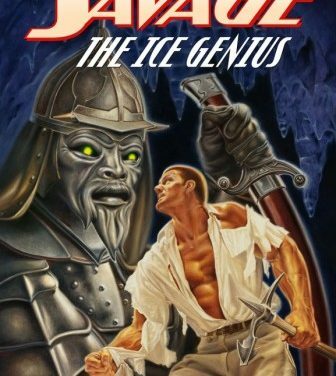 Can even Doc Savage control him once he breaks free of his icy tomb? From the Gobi Desert to war-torn Free China, the Man of Bronze and his fighting crew battle a threat so terrifying that it could change the course of human history…. 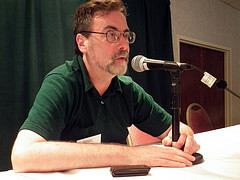 It began with the hijacking of a destroyer from the Brooklyn Navy Yard. The stolen warship struck midtown Manhattan with her mighty guns, then vanished far out to sea. Who were the strange raiders wearing the golden uniforms of no known power who pulled off the daring theft? And who was their mysterious leader, a being of seemingly supernatural abilities? Doc Savage did not know. But The Shadow did! Combining forces, the Man of Bronze and the Dark Avenger follow the trail of a superfoe from The Shadow’s past. But can they learn to trust one another? From fog-shrouded New York to a futuristic underground kingdom in the heart of Asia, the battle sprawls—with the world’s fate at stake! 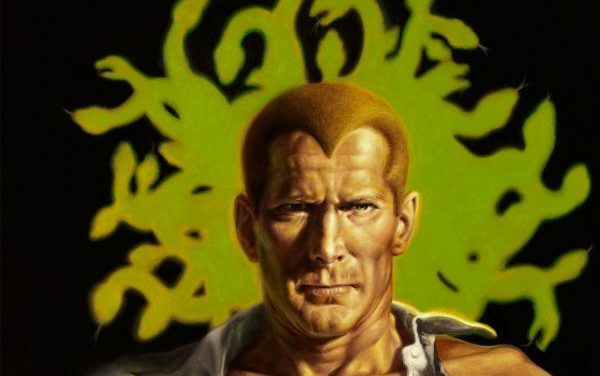 Why did a desperate man shave his head before visiting Doc Savage headquarters, only to be struck down, his pulsing brain turned to inert stone? What sinister secret did his strange slaying silence? And how was a lizard-green shadow resembling Medusa branded on Doc’s office wall? 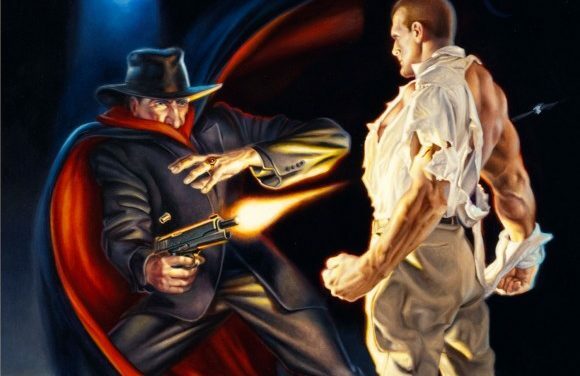 These are only some of the questions confronting the Man of Bronze as he pursues a grisly trail of petrified corpses to post-Prohibition Chicago, whose criminal underworld is being terrorized by a serpent-haired demon engaged in a seemingly senseless slaughter spree whose ultimate target will shake Doc Savage’s men to their core. Suspects are many, clues baffling. Death and danger lurks everywhere they turn—symbolized by the silhouette of a faceless Gorgon. 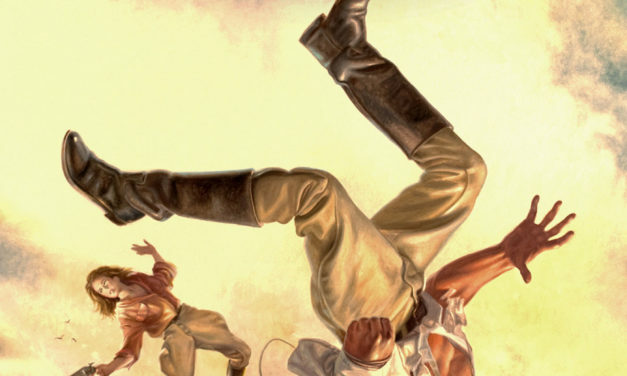 From the concrete canyons of Manhattan to the coal fields of Illinois, Doc Savage tracks a phantom fiend the likes of which he has never before hunted. Or is he the one being hunted? When a vivacious blonde convinces Monk Mayfair to skip an important sea voyage to London, and instead run off to her Louisiana plantation, Ham Brooks is very suspicious. 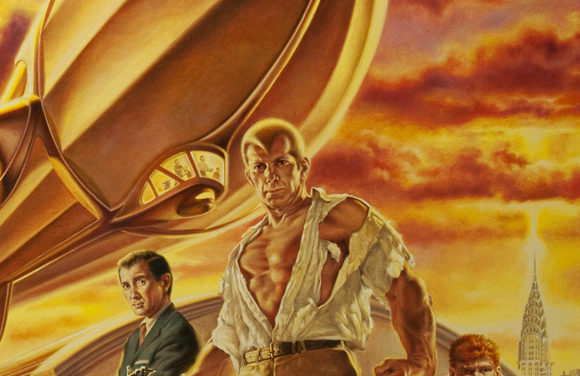 After Doc Savage enters the picture, things start popping. As in fists and guns. Finding themselves on a steamship bound for the Caribbean, Doc, Ham, and a reluctant Monk become embroiled in wartime intrigue surrounding the question of who is desperately trying to keep them off the Northern Star, and why? 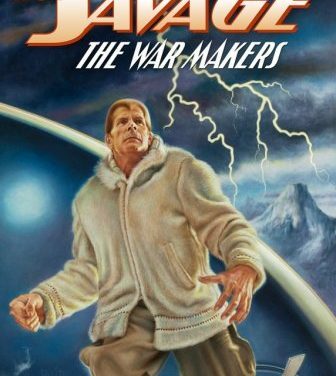 From New York City to the Bahama Banks, Doc Savage and his mighty men follow the trail, making new allies along the way, until they plunge into a hurricane of horror only some will survive…. 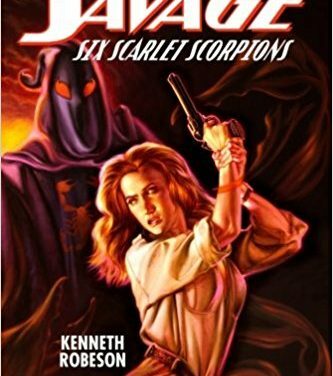 When millionaire Lamont Cranston and attorney Ham Brooks are kidnapped by gunmen driving a black hearse, it spells trouble for Doc Savage. Trouble with compound interest when Cranston’s personal lawyer is mysteriously murdered before he can consult with celebrated criminologist George Clarendon—who is secretly The Shadow! Will these legendary crimefighters join forces—or will the diabolical Funeral Director have the last laugh on Doc Savage and The Shadow? All over the Midwest, cars and trucks were crashing—stopped in their tracks by an inexplicable force! Had some unseen power targeted America’s automotive industry—or was something more sinister at stake? 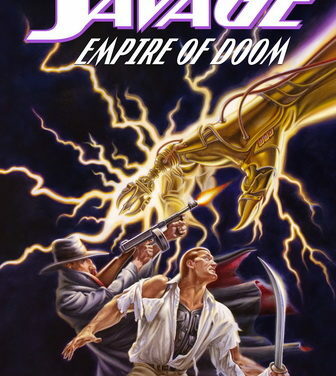 Summoned to solve the mystery, Doc Savage and his intrepid men follow a trail of terror that winds through the continental United States like a constricting serpent of senseless destruction. From the nation’s car capital to the North Pole, the Man of Bronze races to stave off a strangely familiar menace only to confront a completely unexpected foe—the enigmatic Baron in Black! 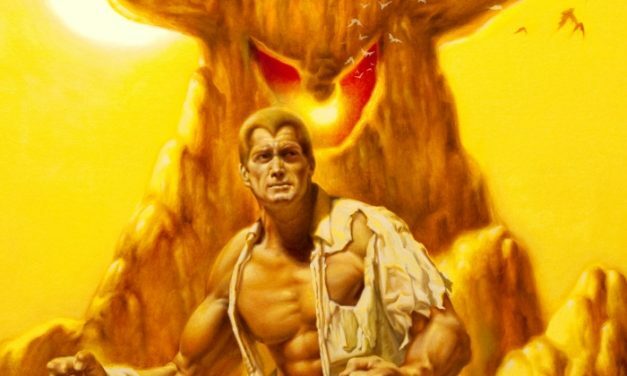 When a brazen adventuress tries to hire Doc Savage for a secret mission—but won’t tell him why—it lights the fuse for one of the most explosive exploits ever to involve the Man of Bronze. Who is Hornetta Hale? Why does she need to rent Doc’s private submarine? And who is so determined to eliminate her that they destroy Doc Savage’s skyscraper headquarters in the process? 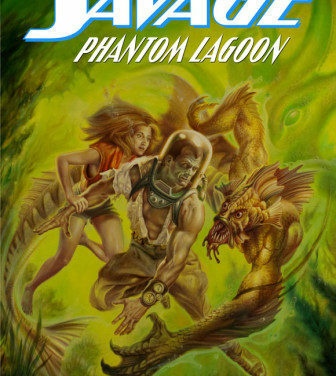 From Manhattan Island to the Caribbean Sea, Doc and his fighting crew chase the most violent gang of criminals they have ever encountered in a desperate race to unlock the secret of Phantom Lagoon. Or are they more than mere criminals? Kong! Before the world knew them, they met…. Before they were legends, they clashed! An urgent summons from his father brings young Clark Savage, Jr. to San Francisco for a mysterious mission: to locate the long-lost clipper ship captained by his legendary ancestor, Stormalong Savage. Their quest will take them to the heart of the Indian Ocean and a fog-shrouded isle unknown to civilization, a place inhabited by dinosaurs unsuspected by history and ruled by a titanic creature known only as… Kong! 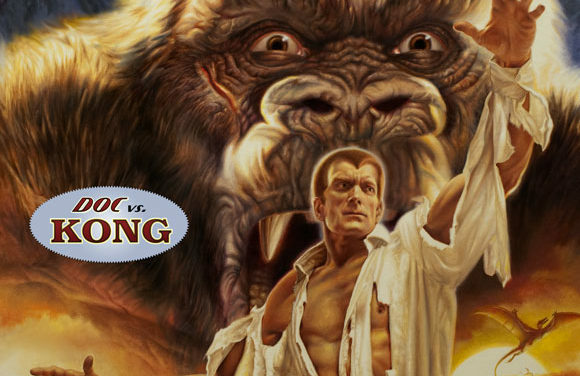 Doc Savage meets his first great challenge in the fierce prehistoric jungles of Skull Island!